The U.S. Army Corps of Engineers has told the Standing Rock Sioux Tribe that the main camp used by people opposed to the Dakota Access pipeline will be closed by Dec. 5. The camp is just north of the Standing Rock Sioux Tribe reservation, where Texas-based Energy Transfer Partners has been trying to complete the contentious Dakota Access pipeline. If finished, the $3.8-billion U.S. pipeline will carry crude oil south to Illinois from northern North Dakota. According to a letter sent to tribe dated Nov. 25, the Corps of Engineers will be "closing the portion of the Corps-managed federal property north of the Cannonball River to all public use and access effective Dec. 5, 2016." The letter states that "this decision is necessary to protect the general public from the violent confrontation between protesters and law enforcement officials that have occurred in this area, and to prevent death, illness, or serious injury to inhabitants of encampments due to the harsh North Dakota winter conditions." Officials from Morton County — where much of the conflict has taken place — welcomed the Corps' decision, calling it the first step toward a peaceful resolution to the situation. "However, this decision means nothing unless the federal government follows up by sending federal law enforcement personnel to enforce the decision," stated Cody Schulz, chair of the county commission. Schulz also urged outgoing President Barack Obama's administration to decide whether the company can complete the pipeline by drilling underneath Lake Oahe on the Missouri River. The river passes directly through the Standing Rock Sioux reservation, and the tribe fears any break could contaminate the water. People in that main camp, however, vow to defy the Corps' deadline. "We stand by our original instructions, as Indigenous Peoples, ready to defend the dreams of our ancestors and protect the sacredness of Mother Earth," wrote Dallas Goldtooth, an activist with the Indigenous Environmental Network, on Facebook. Goldtooth has been at the Oceti Sakowin camp for months. "Hard times may be ahead, but we got this." While a group called the Water Protector Legal Collective, which has been providing legal assistance to people involved in the demonstrations, issued a press release critical of the Corps' reasons for issuing the eviction. 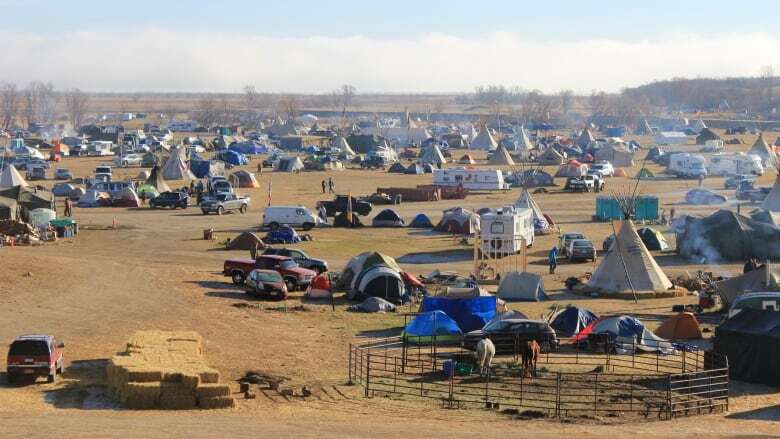 "The violence over the past months has been perpetrated by law enforcement and DAPL security against unarmed Water Protectors in blatant violation of their constitutional rights and treaty rights," the statement read. Anyone on the land after Dec. 5 would be considered to be illegally trespassing, the Corps said. "Our tribe is deeply disappointed in this decision by the United States, but our resolve to protect our water is stronger than ever," said tribal chair Dave Archambault in a statement, who added that it was an unfortunate decision made a day after U.S. Thanksgiving. "Although the news is saddening, it is not at all surprising given the last 500 years of the mistreatment of our people," Archambault added. The Corps said that people opposed to the pipeline could freely demonstrate in a "free speech zone," which would be established south of the existing camp. The tribal chair didn't say anything about what people in the camp should do, instead urging the public to contact Obama and ask that he rescind the federal permits required to complete the pipeline. More than 500 people have been arrested in demonstrations since the summer and one woman nearly lost an arm when she was injured during a clash with police on Nov. 20.